To say our church purpose is to love God and others but yet to communicate in ways that fail to demonstrate that love is a contradiction which people will pick up on. 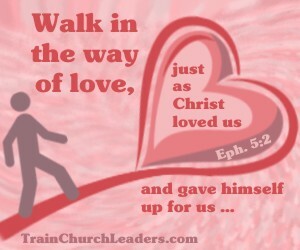 We are to “walk in the way of love” (Eph. 5:2) which includes our communication. To walk in the way of love is to keep in step with our primary purpose. Yes, we must speak the truth with people but we need to do it in love — “speaking the truth in love” (Eph. 4:15). Let’s keep that familiar phrase in context. Ephesians 4 begins, “live a life worthy of the calling you have received” and then goes on with how we should live toward one another in peace and unity, demonstrating the oneness God intends for the Body. The Means: Gifted members of the Body “equip his people for works of service, so that the body of Christ may be built up” (v. 11-12). The Evidence: When we become mature we will not be deceitful nor fall for deceitfulness. Rather, we will speak the truth in love (v. 14-15). As everybody does their part, the Body “grows and builds itself up in love” (v. 16). Our purpose to love God and others permeates all we do in increasing measure. The remainder of Ephesians 4 exhorts us “put off your old self … and to put on the new self” (v. 17-24) with examples of what that looks like (v. 25-32). Then we get “Follow God’s example, therefore, as dearly loved children and walk in the way of love, just as Christ loved us and gave himself up for us as a fragrant offering and sacrifice to God.” (Eph. 5:1-2) The word “therefore” suggests it is based on what came before which signifies that the examples given in Ephesians 4:25-32 are what we need to do to walk in the way of love. We can so easily slip back into the default mode of our “old self” rather than the “new self”. We can let our personalities dictate attitudes and responses if we fail to keep our communication in step with God’s purpose for us to love. Let’s “walk in the way of love” (Eph. 5:2) “speaking the truth in love” (Eph. 4:15). Hello, Peter Stephen. Communication is an important element of leaders relating with people. For tips on communicating, go to: Leadership Skill – Communication Also read: Leadership Skill – Listening In addition, let me suggest you look at the Leadership Qualities to see how we relate to people as examples, guides, servants, and shepherds. Follow the links on that page for more about each of these traits.